The sun is entering a period of peak solar storm activity, with an associated measurable risk of destroying our entire electricity grid for 4 – 10 years. Solar flares interfere with radio communications to a greater or lesser extent (depending on the magnitude of the flare), and potentially to other electrical and electronic equipment as well, including causing the loss of power to all of Quebec in 1989. With our increasingly connected world, the potential for greater damage from solar flares seems to be increasing. And talking about increasing, solar activity follows an eleven year cycle. We are nearing the peak of this current cycle, which will hit the maximum in May 2013 (assuming that the world doesn’t end in December 2012! ), before dropping down over the 5.5 years that follow before then rising up again. July 4 this year was notable not only for our usual fireworks, but for additional fireworks courtesy of the sun – a solar flare eruption that registered max on the solar flare scale (it has five level – A, B, C, M and X, with each level being ten times greater than the one before, meaning an X flare is 10,000 times greater than an A level flare. This was an X level flare, although note the largest X level flare recorded. That distinction might possibly belong to one in 1859 – what is often referred to as the Carrington flare and which was many times more powerful than the 1989 flare that disrupted Quebec’s power grid. Some disruption has been experienced by some radio services. More is expected. Here’s an interesting article on the recent eruption. You probably know about the earth’s magnetic field – it has a magnetic north and south pole, slightly away from the geographical ‘true’ north and south poles. The magnetic field is what allows compasses to work, and also helps protect us from solar radiation. The sun too has a north and south pole, and part of the reason for its 11 or so year cycles of activity is due to the magnetic field flipping (when this happens corresponds to times of maximum solar activity). But something happened, and the sun has now been observed to have two north poles and two south poles – it has become a quadrupoled object. The sun’s magnetic field influences the frequency and intensity of its solar storms. This new quadrupole configuration (first reported here) has unknown implications for what we can expect, but Murphy’s Law being what it is, the chances are that this is not a good development. Interestingly though, it may lead to a period of lesser solar activity, which would also have harmful effects – less solar activity would mean a period of global cooling here. So, what does all this mean for us? 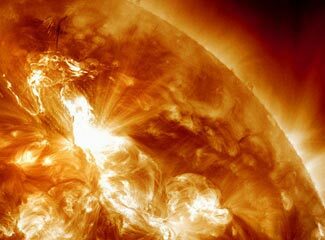 In an earlier article about solar disruptions, we reported that experts predict there is a 12% chance that sometime in the next 10 years we might suffer a ‘super sun storm’ that could potentially wreck our entire electricity grid, cause $10 – 20 trillion in damage and take 4 – 10 years to recover from. With the cyclical nature of these things, most of that 12% risk would seem to be concentrated in the next year or two, as we get closer to this cycle’s period of maximum activity. Stay tuned for more updates. Unless, of course, the power goes down!